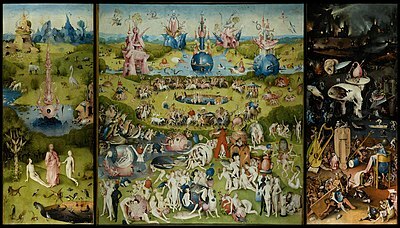 Genres which may also be considered as Fantastic Art include the Symbolism of the Victorian era, and Surrealism. Works based on classical mythology, which have been a staple of European art from the Renaissance period, also arguably meet the definition of Fantastic Art, as art based on modern mythology such as JRR Tolkien's Middle Earth mythos unquestionably does. Religious art also depicts supernatural or miraculous subjects in a naturalistic way, but is not generally regarded as Fantastic Art. Many artists have produced works which fit the definition of fantastic art. Some, such as Nicholas Roerich, worked almost exclusively in the genre, others such as Hieronymus Bosch, who has been described as the first "fantastic" artist in the Western tradition, produced works both with and without fantastic elements, and for artists such as Francisco de Goya, fantastic works were only a small part of their output. Others again such as René Magritte are usually classed as Surrealists but use fantastic elements in their work. It is therefore impossible to give an exhaustive list of fantastic artists, but a selection of major and influential figures is listed below. The rise of fantasy and science fiction "pulp" magazines demanded artwork to illustrate stories and (via cover art) to promote sales. This led to a movement of science fiction and fantasy artists prior to and during the Great Depression, as anthologised by Vincent Di Fate, himself a prolific SF and space artist. In the United States in the 1930s, a group of Wisconsin artists inspired by the Surrealist movement of Europe created their own brand of fantastic art. They included Madison, Wisconsin-based artists Marshall Glasier, Dudley Huppler and John Wilde; Karl Priebe of Milwaukee and Gertrude Abercrombie of Chicago. Their art combined macabre humor, mystery and irony  which was in direct and pointed contradiction to the American Regionalism then in vogue. In postwar Chicago, the art movement Chicago Imagism produced many fantastic and grotesque paintings, which were little noted because they did not conform to New York abstract art fashions of the time. Major imagists include Roger Brown, Gladys Nilsson, Jim Nutt, Ed Paschke, and Karl Wirsum. Non-European art may contain fantastic elements, although it is not necessarily easy to separate them from religious elements involving supernatural beings and miraculous events. Sculptor Bunleua Sulilat is a notable contemporary Asian Fantastic artist. ^ a b "Jahsonic, a vocabulary of culture". Retrieved 4 August 2013. ^ "thinkexist.com". Archived from the original on 4 August 2013. Retrieved 4 August 2013. ^ Di Fato, Vincent. Infinite Worlds: The Fantastic Visions of Science Fiction Art. ^ Richard Vine, "Where the Wild Things Were", Art in America, May 1997, pp. 98-111. Coleman, A.D. (1977). The Grotesque in Photography. New York: Summit, Ridge Press. Watney, Simon (1977). Fantastic Painters. London: Thames & Hudson. Colombo, Attilio (1979). Fantastic Photographs. London: Gordon Fraser. Johnson, Diana L. (1979). Fantastic illustration and design in Britain, 1850-1930. Rhode Island School of Design. Krichbaum, Jorg & Zondergeld. R.A. (Eds.) (1985). Dictionary of Fantastic Art. Barron's Educational Series. Menton, Seymour (1983). Magic Realism Rediscovered 1918-1981. Philadelphia, The Art Alliance Press. Day, Holliday T. & Sturges, Hollister (1989). Art of the Fantastic: Latin America, 1920-1987. Indianapolis: Indianapolis Museum of Art. Clair, Jean (1995). Lost Paradise: Symbolist Europe. Montreal: Montreal Museum of Fine Arts. Palumbo, Donald (Ed.) (1986). Eros in the Mind's Eye: Sexuality and the Fantastic in Art and Film (Contributions to the Study of Science Fiction and Fantasy). Greenwood Press. This page was last edited on 23 March 2019, at 18:49 (UTC).